HUTCHINSON — Without question every team playing for a state football title has more than earned their way to their respective championship game. But the argument could certainly be made that no teams earned their spots in Saturday’s season finale more than Sabetha and Pratt. As tough as the road to a championship is, the path through the Class 3A brackets just packed a lot more punch with the class arguably the deepest of any in the state this year with title contenders. The four teams defending 3A champion Sabetha played in the playoffs combined for a 31-11 record this year. That includes a 21-0 win over undefeated Galena in last week’s semifinal. Pratt’s road was even more difficult. After rolling past Concordia in the first round, the Greenbacks had to take on one-loss Colby, undefeated Smoky Valley and undefeated Andale just to reach the title game. Both teams have survived one test after another this year and will take perfect 12-0 marks into Saturday’s 1 p.m. championship game at Hutchinson’s Gowans Stadium. “Once we got to the playoffs, we saw some teams that were really, really good and we had to be ready to go every week,” Pratt coach Jamie Cruce said. “Every week, you had to be ready to go physically and mentally. And our kids just did a great job of handling everything that came their way." Sabetha coach Garrett Michael agreed, noting that Sabetha’s grind began in Week One when the Bluejays took on arch rival Nemaha Central, the only team to beat them during last year’s championship season. 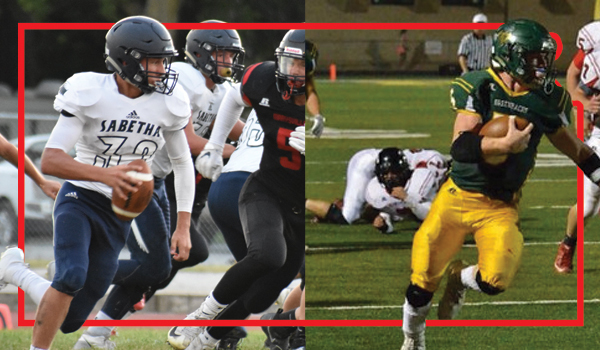 The new-look Class 3A district format left Sabetha in one of the state’s toughest, taking on the likes of former 4A schools Holton and Wamego as well as Marysville – the team Sabetha beat in last year’s 3A title game. "It started with our district with Holton moving down to 3A and Wamego as well," Michael said. "And we all know what Marysville brought to the table. The only league school we didn't play was Jefferson West and we had them in the first round of the playoffs and they are so physical and athletic up front. Then you get Perry for a second time and they're so dangerous and speed all over the field in Parsons and just a great team in Galena. I think both teams have been prepared well for this game." Sabetha returned a bulk of last year’s title team, including standouts such at Elliott Strahm, Gabe Garber, Joseph Gruber and Cauy Rokey. Yet despite all that experience, Michael knew his team was entering uncharted territory this season. "Last year, we were kind of a no-name team," Michael said. "Nobody was counting us in on anything and I thought we played well in the playoffs, got our opportunity and made the most of it. This year, I talked to our team that now the bull's-eye is on our back and every game is going to be huge as far as the other team giving us our best shot. Our kids have just done a really good job of taking it one game at a time." Sabetha has not only handled a tough schedule, but some serious blows to its own roster throughout its run. Through four games, Mason Engelken was leading the Bluejays in rushing with 464 yards and five touchdowns but saw his season come to an end with repeated concussions, leaving the Bluejays without their fastest tailback who ran for 967 yards and 12 touchdowns last year. Senior tailback Joel Hackney also was expected to be a big contributor after rushing for 585 yards and eight touchdowns in a backup role last year. But he's been limited to just nine games and missed last week's semifinal win over Galena. Sabetha has overcome the loss of two of its top-three tailbacks, however, and Joseph Gruber (1,286 yards, 16 touchdowns) and Gabe Garber (1,057 yards, 17 TDs rushing, 930 yards, 11 TDs passing) have carried the load with Mason Spellmeier and Tristan Edelman stepping in and providing help with 466 combined yards. "Every team does this, just have the next man up mentality," Michael said. "But these kids have done a really nice job of the guys that are waiting in the wings or had to move picking up where those guys left off. It's such a tight-knit group that they have the confidence in everybody that's there can get the job done. There's no real panic in them." Then again, with the way Sabetha's defense has played this year, the offensive blows haven't seemed to debilitating. The Bluejays have given up just 92 points all season, pitching five shutouts. Last week's goose egg might have been the most impressive with Sabetha completely shutting down a Galena offense which was averaging better than 44 points per game. "Defensively, they're really good," Cruce said. "Their linemen are big and do an awesome job of using their hands and getting arms extended and keep your lineman from releasing. They're a tough team. ... It's going to be a tough game, one where it's four quarters and we have to be ready to play. We have to expect another Andale-type of game." Sabetha's defense will get arguably its greatest challenge of the season this week. Pratt has scored less than 34 points just once this year and less than 40 just four times. The Greenbacks boast arguably the most dynamic and productive player in the state in senior quarterback Travis Theis. A tailback his first three seasons, Theis has enjoyed a monster season to cap a huge career. Theis has run for 2,358 yards and 38 touchdowns and also thrown for 842 yards and 10 touchdowns. In his career, Theis has rushed for 6,494 yards and 96 touchdowns, putting his name among the state's all-time great ground gainers. "I think he's the best player in 3A offensively and he's dang good defensively too," Michael said. "He's the gas that makes their engine run, but they have a lot of players around him and they're good up front on both sides of the ball. He can throw any pass he wants to and if you cover that, he runs it so well. He's very dangerous." Both teams have championship pedigree with Sabetha winning last year’s Class 3A state championship and Pratt capturing the Class 4A Division II title in 2016.